Professional stress is defined as a “pattern of emotional, cognitive, behavioral, and physiological reactions to adverse and harmful aspects of work content, work organization, and the working environment.” These harmful physical and emotional responses occur when the requirement of the job does not match the capabilities, resources, or needs of the worker. Nursing has always been recognized as a stressful profession,, but this cannot be explained merely on the basis of increased workload. Research,,,,,, done in different countries suggests that the causes of nursing stress could vary from constant shift duties, interpersonal conflicts with peers, seniors, patients, or doctors to performing tasks not related to nursing and dealing with life-threatening emergencies. Occupational stress in nurses is significant for a number of reasons. There is evidence to suggest that work-related stress decreases the quality of nursing and nursing care and increases the chances of making errors. This could have an adverse impact on patient care. Secondly, research has shown that prolonged stress can not only trigger the development of physical disorders of the musculoskeletal and cardiovascular system but also increase the vulnerability to psychiatric illnesses such as depressive and anxiety disorders. Therefore, it can lead to poorer health in the nurses themselves. Finally, professional stress is often a precursor to decreased job satisfaction, increased burnout, absenteeism, and turnover of nursing staff. Nurses are the largest workforce in the health-care sector, and an unhealthy work environment is one of the important factors contributing to worldwide nursing shortage. The concept of nursing stress has, no doubt, been explored in the Indian subcontinent with studies reporting a significant stress among Indian nurses.,,, However, it is obvious that stress in nurses has important implications not only for the nurses themselves but also for the patients and health-care services. Thus, given the vast scope of the subject, it is imperative that a much larger body of research is warranted. To study any correlation between stress levels and the extent of somatic complaints. This was a cross-sectional, observational study conducted at the Department of Psychiatry, BARC Hospital, Anushaktinagar, Mumbai. Individuals working as a staff nurse at BARC Hospital for more than 1 year, in shift duties, willing to participate in the study and not having a diagnosed, preexisting psychiatric illness by self-report were included in the study. The nurses were informed of the research objectives and assured of the confidentiality of their responses. A semi-structured pro forma was designed to collect the sociodemographic data. The pro forma along with the study instruments were distributed to 120 consenting nurses in a survey method. Convenience sampling was used. One hundred and five questionnaires were returned but 8 were incompletely filled hence were excluded from the study. Thus, 97 study pro formas were analyzed. This gave the survey an overall response rate of 80.8%. The data analysis was carried out using the IBM SPSS Statistics for Windows, version 20.0, (Armonk, NY, IBM Corp.). 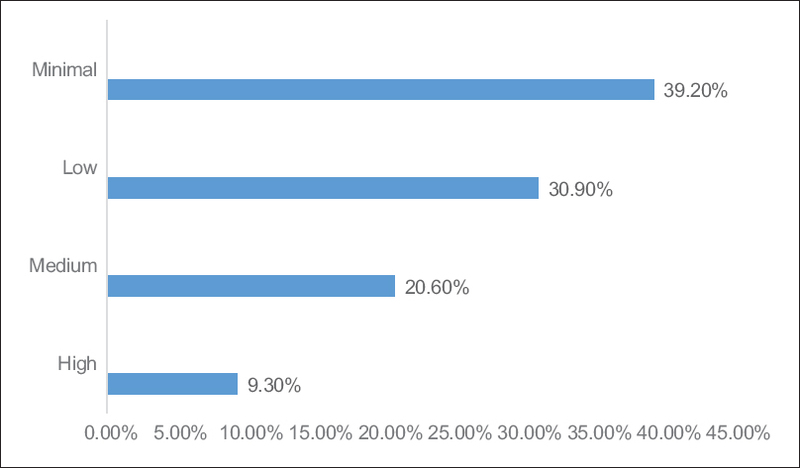 The sociodemographic data and prevalence of occupational stress have been mentioned in terms of percentages. The scores on the scales were checked for normal distribution using the Shapiro–Wilk test. The scores on the scales and subscales have been expressed in terms of mean, standard deviations, and median scores with interquartile range. The scores on the three factors of the scale were compared using the paired t-test. The scores on the ENSS have been compared among nurses with different years of experience using the analysis of variance (ANOVA). The correlation between occupational stress and somatic complaints was assessed using the Spearman's correlation coefficient test. P =0.05 was regarded as statistically significant. A total of 97 staff nurses were studied. 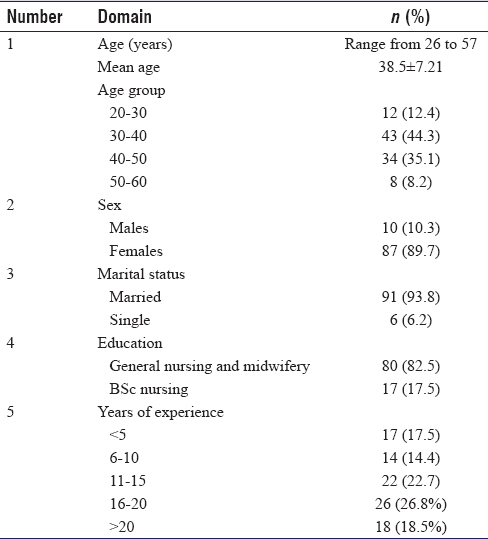 The demographics of the study population was as shown in [Table 1]. The total individual scores on the ENSS were found to be normally distributed (Shapiro–Wilk Sig = 0.105). They ranged from 46 to 201, and the mean total score for the study population was 124.06 ± 32.58. The mean scores for each individual ranged from 0.81 to 3.53, and the individual mean score was 2.17 ± 0.57 which corresponded to a mild level of stress. The prevalence and severity of stress was as shown in [Figure 1]. Thus, 87.6% nurses experienced stress. The causes of stress and the mean individual scores in each of the subscales were as shown in [Table 2]. Among the three factors identified from the nine subscales, the mean score for stress was the highest in the physical working environment, i.e., 2.53 ± 0.71. The mean score on the social environment was 2.04 ± 0.60 and psychological environment was 2.02 ± 0.57. These two scores did not differ significantly from each other (t = −0.523; df 96; Sig = 0.602; 95% Confidence interval – Lower 0.118 and Upper 0.68). However, the mean score on the physical working environment was significantly higher than the social environment (t = 10.33; df = 96; Sig = 0.00; Confidence interval – Lower 0.397 and Upper 0.586) and psychological environment (t = 9.02; df = 96; Sig = 0.00; 95% Confidence interval – Lower 0.403 and Upper 0.630). 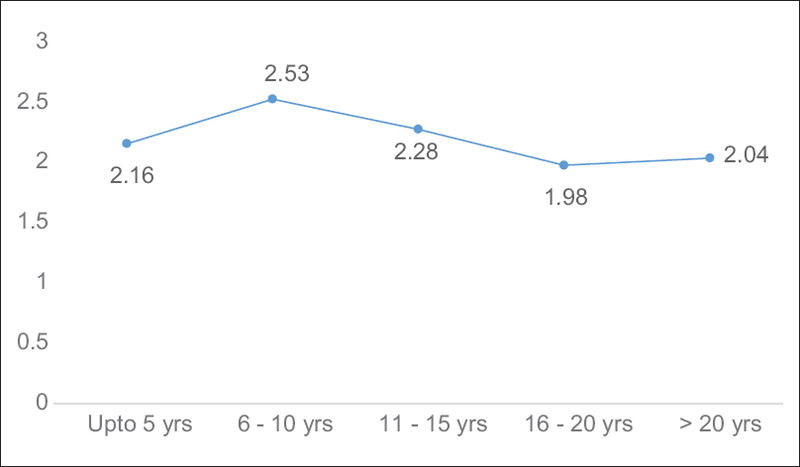 Depending on the number of years of experience, the nurses were divided into five groups, and the total scores on the ENSS for each group have been plotted in a graph in [Figure 2]. The levels of occupational stress across the groups were compared using ANOVA. It was found that the groups differed significantly (F (4, 96) = 2.70 P = 0.032). Post hoc least significant difference test showed that nurses with 6–10 years of experience had significantly higher stress (Mean = 144.71 ± 28.7) as compared to nurses with more than 15 years of experience (Mean = 114.6 ± 31.4). The scores on the PHQ–15 were not found to be normally distributed (Shapiro–Wilk Sig = 0.00). The mean score for the study sample was 6.98+ standard deviation = 4.74. The median scores were 6.00 with an interquartile range of 7. These scores correspond to a low level of somatic complaints. 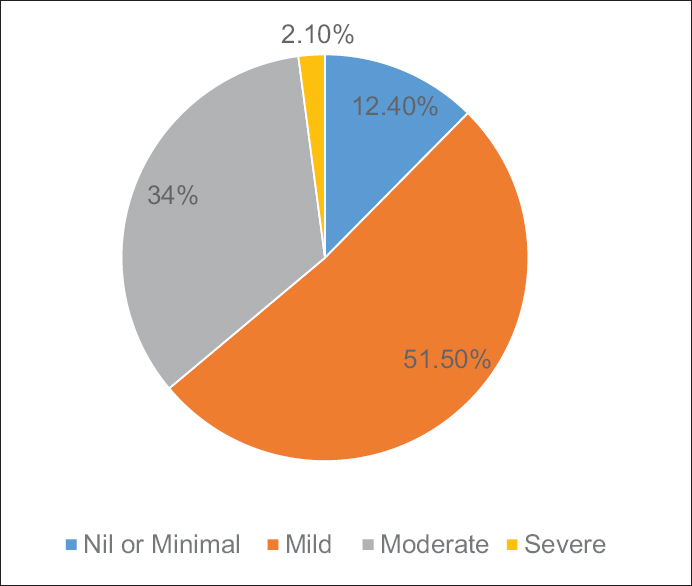 The prevalence of somatic complaints was as shown in [Figure 3]. There was a significant positive correlation between the scores on the ENSS and scores on the PHQ–15 (Spearman's rho = 0.347 P < 0.001) indicating that higher levels of stress were associated with increased somatic complaints. Of the 193 nurses working at BARC Hospital, 120 consented for participation and the final analysis included data collected from 97 nurses. This gave the study a margin of error of 7% and a confidence level of 95%. The English version of the ENSS scale was used, and valid psychometric properties were noted within our study sample. The Cronbach's alpha was used to assess internal consistency. For the entire scale, the Cronbach's alpha was 0.945, and it was approximately 0.7 for all subscales except discrimination wherein it was 0.514. Exact comparison across studies is not possible due to the use of different instruments and methodology. We noted that 87.6% of the nurses reported occupational stress, of which 34% experienced moderate stress while 2.1% experienced severe stress. Similar findings have been reported in a study by Bhatia et al. in which 87.4% nurses found their jobs stressful with 32.2% experiencing severe to extreme stress. In a study done by Kane, the prevalence of stress was found to be 73.59% in the study population. Both these studies had used different instruments to assess occupational stress. Research done by Shiv Prasad in which the ENSS was used had reported that 92% nurses experienced stress, of which 52% had severe to very severe stress. All these findings unequivocally indicate that there is a very high prevalence of occupational stress among nurses in India. The mean individual score on the ENSS was 2.17 ± 0.57 which corresponded to a mild level of stress. Three studies from the Middle East have used the same scale and reported the mean scores to be much higher, i.e, 2.8 ± 1.4 in a study from Jordan and 2.5 ± 1.29 and 2.6 in two studies from Saudi Arabia., Thus, the overall severity of stress was much milder in our study as compared to these studies. The reason for this discrepancy could be that these hospitals from the Middle East dealt mainly with oncology, neuroscience, and transplants – departments known associated with high mortality and morbidity, whereas our study was conducted in a general hospital setting. Furthermore, discrimination and sexual harassment were high in their population, which was negligible in our study. Among the three main factors in the scale, the score on the physical working environment was significantly higher than the scores on the psychological and social working environments. A similar finding was reported by a Serbian study. This reflects the high workload faced by the nurses. As per the Indian Nursing Council (INC), the nurse to patient ratio is to be 1:5 in general wards and higher in specialty units. The present study collected data from nurses working in all different units of the hospital; hence, this ratio was not constant. A recent analysis of the data from the INC and the World Health organization by a private agency revealed that India is short of 1.94 million nurses. In most hospitals, the nurses are often entrusted with several tasks such as supervising the ward attendants, overseeing the housekeeping, laundry, beddings, repairs, and indents, attending numerous phone calls, and arranging for patient investigations, referrals, discharges, and transfers, in addition to patient care. Appropriate staffing not only leads to improved patient care but also facilitates allocation of fairer nursing workloads. It also helps nurses to regain confidence and control over their working conditions. The causes of stress were compared only with those studies that have used the ENSS, for obvious reasons. In our study, conflicts with supervisors, unreasonable demands from patients and their families, workload and limited experience with death and dying were the leading causes, while problems relating to peers and discrimination were the least common. There is considerable variation in the findings reported across studies. Problems related to peers and inadequate preparation to deal with patient's emotional issues have consistently emerged as the least stressful issues in most studies.,,,, This is similar to our findings. Death and dying have shown itself to be the biggest stressor in three studies,, and among the leading causes in other studies., Similarly, conflicts with supervisors, unreasonable demands from patients and their families, and workload have also been identified as top causes. Other stressors such as uncertainty regarding treatment,,,, conflicts with other health-care professionals, and discrimination, have been identified as among the top four causes of occupational stress in different studies as cited. The primary reason for these differences is the setting in which the study is conducted. Our study was conducted on nurses who were the employees of the central government, working in a general postgraduate teaching hospital that caters to the employees of a central government organization, availing a health-care scheme. The nurses also avail the same health-care services. Their salaries are on par with pay commission standards. In addition, our organization also provides housing, transportation, and schools for the children. The scenario might not be the same for the nurses included in other studies. Nurses working in critical care and superspecialty settings are faced with repeated experiences of patient death and disability.,, On the other hand, nurses working in teaching hospitals cater to a very large number of patients, leading to increased workload and increased conflicts. Nurses working in private hospitals very often do not have a pay structure and job security compatible with government hospitals, leading to higher stress and a different set of occupational issues. Exploring the role of possible protective factors was beyond the scope of the present study; however, this finding does provide an interesting direction for future research. The disparity, nevertheless, highlights the need for every organization to independently review the causes of stress in an effort to take some remedial measures. Extrapolating the findings of other studies may perhaps not be an effective strategy for stress management. In our study, nurses with 6–10 years of experience had the highest stress, and this was significantly higher than nurses with >15 years of experience. These findings are in contrast with an Indian study in which stress was not associated with years of experience. An international study from Saudi Arabia also reported no significant association between levels of stress and years of experience. However, a study done in Serbia reported that nurses in the age category of 30–39 years experienced a higher stress level compared to their younger or older coworkers, which is somewhat similar to our findings. While more research is required to throw light on this observation, it could be possible that the mid-level nurses have both an increased responsibility as well as an increased workload which could have contributed to increased stress. On the other hand, increased experience on the job may have helped the senior nurses develop more protective mechanisms to counter stress. There is robust evidence to suggest that somatic complaints are highly prevalent among nurses.,,, There was a significant positive correlation between the severity of occupational stress and somatic symptoms perceived by the nurses in our study. Similar findings have been reported by Indian, as well as international studies., These findings do not imply a singular and causal relationship between occupational stress and somatic complaints. The relationship between chronic stress and disease is intricate and can be influenced by the type and severity of stressors, their persistence as well as the person's genetic vulnerability, personality factors, psychosocial resources, and coping styles. There is however sufficient evidence to conclude that stress can contribute to the precipitation, persistence, and perpetuation of various psychosomatic ailments. Efforts to alleviate stress could therefore prove effective in enhancing health. There was a significant positive correlation between the severity of stress and somatic symptoms. It has all the limitations inherent to cross-sectional studies. Nurses experience significant occupational stress and the causes of stress can vary in different settings. Stress can have an adverse impact on the health of the nurses. Hence, this issue needs to be explored on a priority basis and the onus of this effort must lie with the organization. A commitment to develop targeted interventions at stress reduction could not only benefit the individual nurse in particular but also our patients and the health-care services at large. We would like to thank Matron, Assistant Matron and Nursing staff of BARC Hospital for their kind cooperation. Milutinović D, Golubović B, Brkić N, Prokeš B. Professional stress and health among critical care nurses in Serbia. Arh Hig Rada Toksikol 2012;63:171-80. OSHA. Stress at Work. United States National Institute of Occupational Safety and Health. Cincinnati: OSHA; 1999. Zaghloul AA. Developing and validating a tool to assess nurse stress. J Egypt Public Health Assoc 2008;83:223-37. Farrington A. Stress and nursing. Br J Nurs 1995;4:574-8. Bhatia N, Kishore J, Anand T, Jiloha RC. Occupational stress amongst nurses from two tertiary care hospitals in Delhi. Australas Med J 2010;3:731-8.
International Council of Nurses. Positive Practice Environment: Quality Work Places = Quality Patient Care. Information and Action Tool Kit. International Council of Nurses; 2007. Available from: http://www.icn.ch/matters_stress.htm. [Last accessed 2018 Feb 19]. Huang LH. Transition from student nurse to staff nurse. Hu Li Za Zhi 2004;51:33-6. Saleh AM, Saleh MM, Aburuz ME. The impact of stress on job satisfaction for nurses in King Fahad specialist hospital- Dammam-KSA. J Am Sci 2013;(3):371-7. Aburuz ME. A comparative study about the impact of stress on job satisfaction between Jordanian and Saudi nurses. Eur Sci J 2014;10:162-72. Kamal SM, Al-Dhshan MI, Abu-Salameh KA, Abudas FH, Hassan MM. The effect of nurses perceived job related stressors on job satisfaction in Taif governmental hospitals in Kingdom of Saudi Arabia. J Am Sci 2012;8:119-25. Mohite N, Shinde M, Gulavani A. Occupational Stress among nurses working at selected tertiary care hospitals. Int J Sci Res 2014;3:999-1005. Shiv Prasad AH. Work related stress of nurses. J Psychiatr Nurs 2013;2:53-8.
International Labour Organization. World Labour Report. New York: International Labour Organization; 2005. Available from: http://www.inc.ch/psshiftwork.htm. [Last accessed 2018 Feb 19]. 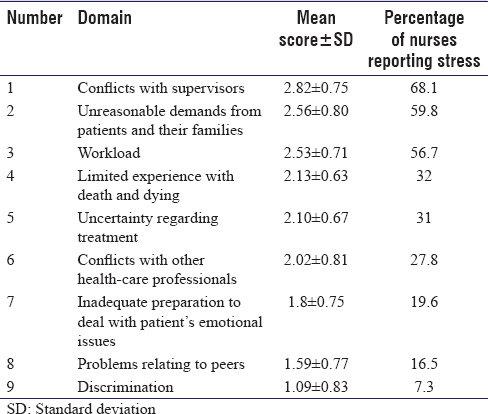 Vahey DC, Aiken LH, Sloane DM, Clarke SP, Vargas D. Nurse burnout and patient satisfaction. Med Care 2004;42 2 Suppl: 1157-66. Rahman HA, Mumin KA, Maing L. Consolidating job stress interventions for nurses: A literature review. Brunei Darussalam J Health 2016;6:44-55. World Health Organization. Work Organization and Stress. Protecting Workers' Health Services No 3. Systematic Problem Approaches for Employers, Managers and Trade Union Representatives; 2004. Available from: http://www.who.int/occupational_health/publications/declaration/enindex.html. [Last accessed 2018 Feb 19]. Kroenke K, Spitzer RL, Williams JB. The PHQ-15: Validity of a new measure for evaluating somatic symptom severity. Psychosom Med 2002;64:258-66. Indian Nursing Council. Guide for School of Nursing in India 2002. New Delhi: Indian Nursing Council; 2002. India Spend; 12 May, 2017. Available from: http://www.everylifecounts.ndtv.com. [Last accessed 2018 Feb 19]. Sharma SD, Shrma YP. An exploratory study on nursing man power requirement for coronary care unit of PGIMER, Chandigarh. Nurs Midwifery Res J 2010;6:14-23. Al-Hosis KF, Mersal FA, Keshk LI. Effects of job stress on health of Saudi nurses working in Ministry of Health Hospitals in Qassim region in KSA. Life Sci J 2013;10:1036-44. Humaida IA. Relationship between stress and psychosomatic complaints among nurses in Tabarjal hospital. Open J Med Psychol 2012;1:15-9. Gandhi S, Sangeetha G, Ahmed N, Chaturvedi SK. Somatic symptoms, perceived stress and perceived job satisfaction among nurses working in an Indian psychiatric hospital. Asian J Psychiatr 2014;12:77-81. Schneiderman N, Ironson G, Siegel SD. Stress and health: Psychological, behavioral, and biological determinants. Annu Rev Clin Psychol 2005;1:607-28.